Determining whether a ladybug is male or female has nothing to do with the size or number of black spots on the insect's orange body. Both sexes have these spots. The male is generally slightly smaller than the female. The ladybug's reproductive organs share the abdomen, along with the digestive and respiratory organs. While their bright orange coloring and black spots make the ladybug one of the world's most identifiable insects, the color and pattern serve a purpose in nature. 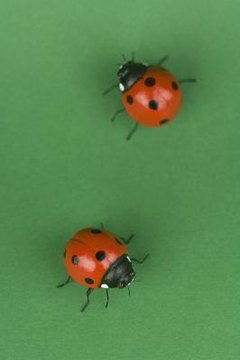 Other insect predators avoid ladybugs because many species of these colorful insects can release a bad-smelling chemical on potential attackers. Because of that, predators avoid insects colored like the ladybug, including those species that don't have the ability to spread an odor. After breeding, female ladybugs lay orange or yellow-colored eggs underneath leaves. These eggs hatch five to eight days later. The larvae consume aphids, also the adult ladybug's primary food, for the next two weeks. During this period, the larvae experience several molts. After the final molt, larvae attach to a stem or leaf and form a pupa. The adult emerges when the temperature rises, which is why you might see ladybugs out during a winter warm spell.